Within the following pages a peak over 2000 feet in height is usually described as a mountain, and one under this height as a hill, occasionally this does alter, but only when I consider the reading of the text necessitates it. A 'peak' or 'top' can refer to either a mountain or hill. Over time some accepted spellings for mountains and place names have changed. Whilst using quotations and listings of hills I have adhered to the original spellings within each respective list and have put these in italics. Hopefully no confusion will arise from doing this. To differentiate between the text that deals with the background to each list and the text that deals with the detailed description of the list itself, the latter has been indented within the text. When each list is introduced its date of publication, or compilation for unpublished listings, author and title are highlighted in bold. Although lists of hills to various individual ranges do exist, the smallest region this article deals with is either Northern or Southern Snowdonia. The one category this article does not detail is listings to the County Tops. The research in to these lists has been greatly enhanced from help given by a number of people. Thanks are due to; Richard Moss, Dewi Jones, Bill Owens, the late George Bintley, David Matthews, Brian Turner (The Wayferers’ Club), Ros Harding (The King's School, Chester), Geof Milburn, David Purchase and Jeff Parr. No history of the hill lists of Wales would be complete without due reverence to Sir Hugh Munro, who in 1891 published his first Tables of the 3000 foot mountains of Scotland. These consisted of 283 separate mountains with a further 255 subsidiary tops. Except for the minimum height criterion the list was arbitrary in nature and blazed a trail for all hill lists that followed. Sir Hugh never quite completed his 538 tops; he was working on a revision of his Tables when he died in 1919 with only three tops remaining to visit. Subsequent years saw the Rev. Archibald Eneas Robertson become the first person to complete Sir Hugh’s 283 ‘Munros’, when on the 28th September 1901 he reached the top of Meall Dearg on the Aonach Eagach. The Rev. A.R.A. Burn in 1923 not only repeated the Munros but also completed the subsidiary tops. 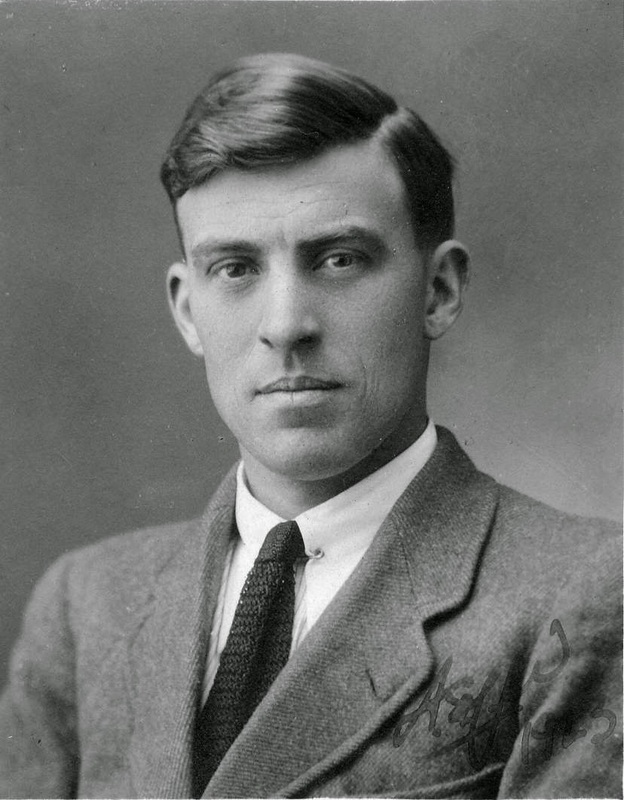 In 1929 J.A.Parker became the third person to complete the Munros. 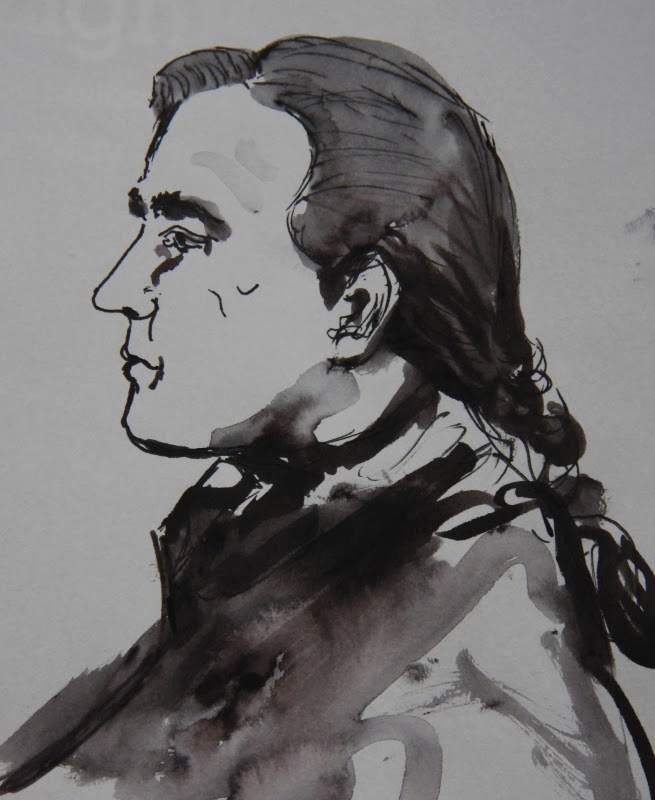 Our Welsh story now properly starts with John Rooke Corbett, Munroist number four. John Rooke Corbett was a district valuer based in Bristol. He completed the Munros and tops in 1930, only the second person to do so. As well as this, Corbett compiled a list of 219 Scottish mountains, between the heights of 2500 feet and 2999 feet, and subsequently climbed them all. His listing of ‘Corbetts’ had no specific written criterion for defining a mountain, the Scottish Mountaineering Club (SMC) who the list was bequeathed to, analysed it and decided that each mountain had to have a minimum re-ascent of 500 feet on all sides. However, subsequent detailed analysis of maps of the time by Robin N Campbell implies that Corbett was using ten separate ring contours to denote one hill from another. The metric equivalent of the 500 feet criterion would form the basis of a much later and important list publication. 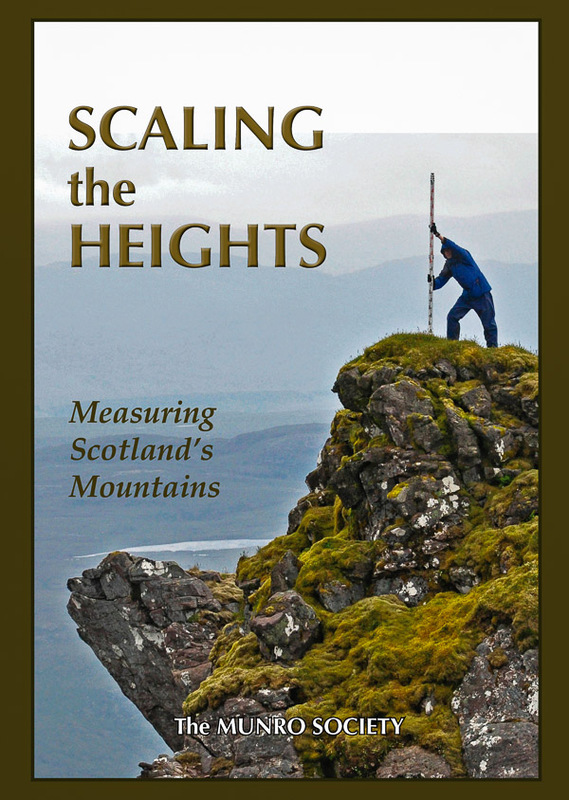 With Corbett’s listing and later publication the minimum height criterion used in a Scottish hill list had been reduced from one of 3000 feet to one of 2500 feet. 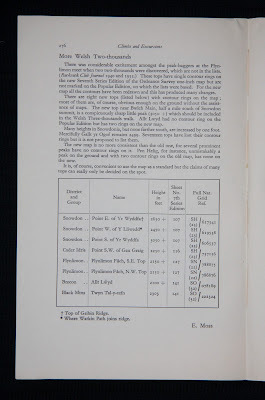 But Corbett had already used this minimum height criterion in a published list in the 1911 Rucksack Club Journal and thus the first published systematic listing of Welsh hills starts. 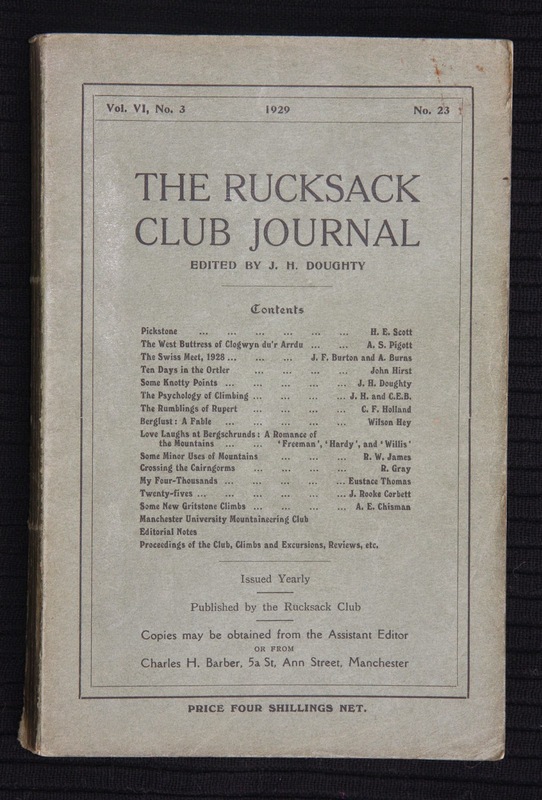 The Rucksack club was formed in October 1902 and its journal started in 1907. Published on an annual basis, its 1911 edition had a five page article entitled ‘Twenty-Fives’. These Twenty-Fives were the 131 mountains above 2500 feet that Corbett had noted in England and Wales. After an introductory page the listing starts with a brief description of each group, followed by the mountain’s name, and in most, but not all cases, its height. 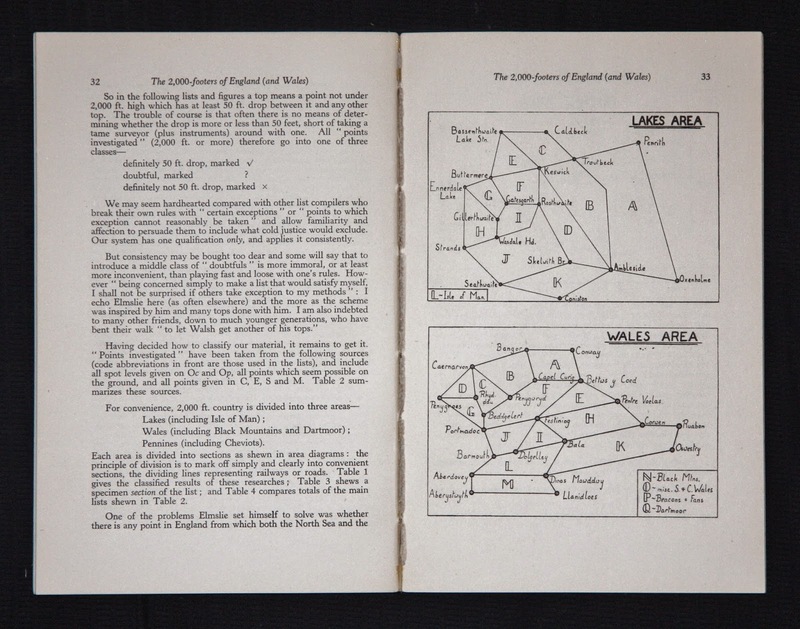 The last two pages relate to Wales with the Berwyn as the first group listed comprising Cader Fronwen and Moel Sych. The next grouping, to the North of Ogwen Lake, consists of fourteen peaks. Eleven mountains make up the third grouping, between the Ogwen and Llanberis passes. Snowdon follows with four listed summits, whilst further West is the solitary peak of Moel Hebog. The Moelwyn make up the next group with Moel Siabod and Moelwyn listed. The following group ranges over an area that includes Arenig Fawr, Aran Mawddwy and Cader Idris; Cowarch is noted in this group as the only one that cannot be reached in an easy day from either Llanuwchllyn or Dolgelly. Corbett’s last group is to the great ridge of old red sandstone that separates Brecknockshire from Glamorgan and comprises nine summits. In all, 51 Welsh mountains are listed. Corbett ends with a remark concerning Plynlimmon, which he states: “Has been described by writers who should know better as the third highest mountain in Wales, [this] only reaches 2,468 feet above sea level”. With this article Corbett had set the precedent that many a subsequent list compiler would follow by incorporating the hills of England and Wales in one publication. It also seems that the accepted spelling of hill names has altered in the years between this list’s publication and the writing of this article. Corbett’s reasoning for producing the list was based upon the peak-bagging exploits of the then president of the Rucksack Club, Philip S. Minor. Corbett goes on to explain that: “Minor was the first to take up the idea of ascending every mountaintop in England and Wales over 2500 feet”. Because of this, members of the Rucksack Club scrutinised reputable maps of the time, such as Bartholomew’s or the one-inch Ordnance map, and if any point was above the 2500 foot contour line and was marked, it went on the list. This of course was only done as Minor was approaching the completion of his task, so he could at least do it properly. Although the exact date is unknown, Philip S. Minor became the first person to complete the Twenty-Fives when he finished Corbett’s list in 1911 or 1912. Although Corbett’s Twenty-Fives is accepted as the first systematic listing of Welsh hills to be published, it certainly wasn’t the first published listing. During the Victorian age, hills with their respective heights were sometimes divided into groups and occasionally appeared in published format. Harry Longuville Jones’s ‘Illustrations of the natural scenery of the Snowdonian mountains, accompanied by a description, topographical and historical of the county of Caernarvon’ is but one example. Charles Tilt of London and Thomas Stevenson of Cambridge published this in 1829. It included hills, with their heights, arranged in six divisions of mountains. 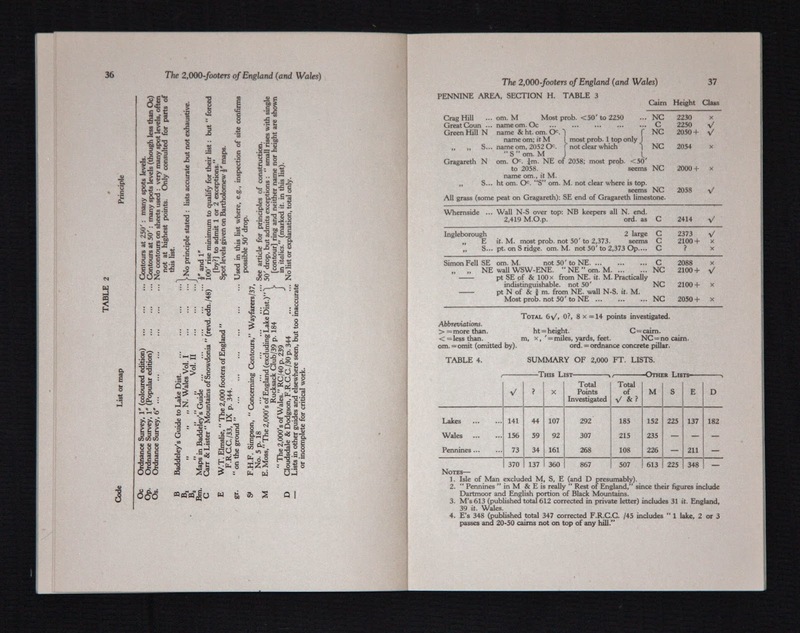 But detailed listings with a set criterion for defining a mountain only arrived in Wales with John Rooke Corbett’s 1911 publication. It was only a year later when after thorough and exhaustive examination of the map of England and Wales, that an update to the ‘Twenty Fives’ appeared. Only a year after the ‘Twenty-Fives’ had been published an update to the list appeared. During the intervening year members of the Rucksack Club had scrutinised maps of the time and come across seven omissions from the original list. Five of these are in England, including the infamous Pillar Rock and The Knowe on Harter Fell, which was believed to be the only twenty-five Mr Minor had not been up. Although input had been received from a number of club members the update was assigned to John Rooke Corbett with his initials J.R.C. appearing at the end of the article. 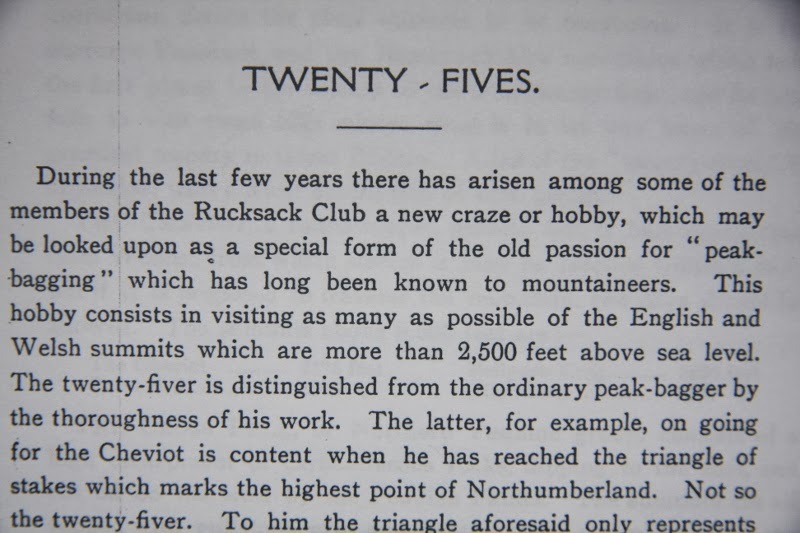 The update to the ‘Twenty-Fives’ appeared on page 166 in the 1912 publication of the Rucksack Club Journal Vol II, No. 2 and is entitled ‘Excursions’. 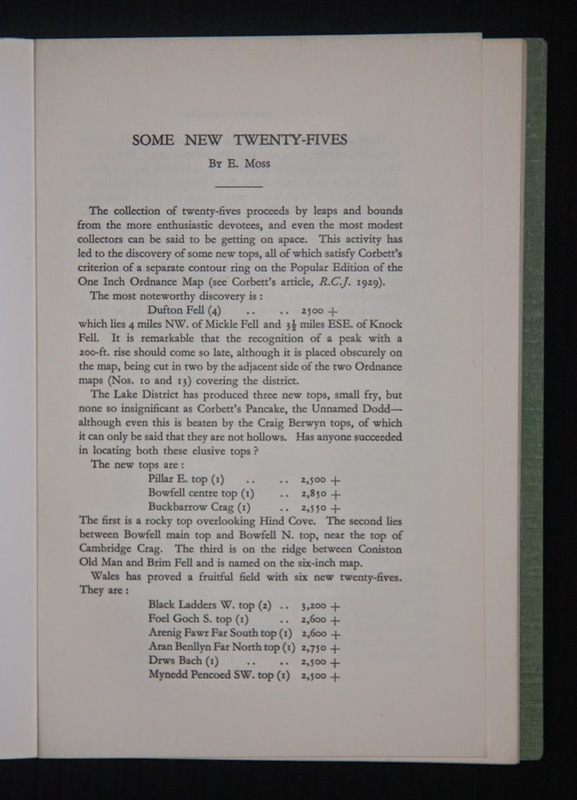 After an introductory paragraph with the lead heading of Twenty-Fives, the mountains are listed. These are indented from the text of the article and only appear in name, with no height given. Some have a brief explanation to their whereabouts. Of the seven listed only two are in Wales, these are Cader Berwyn, on the Berwyn Ridge; and Pen-y-Nantllyn, between Gader Fawr and Waun Fach. Corbett explains that there is a case for the inclusion of Gallt-y-Gogof, which the Ordnance Surveyors had given a height of 2,499 feet above sea level. He explains that the mountain could be thought of as being 2,500 feet high at low tide as unsatisfactory, as it is always low tide at some point on the coast of Britain and high tide at some other point. Other thoughts are also expressed as it was countered this peak should be included if any person more than two feet high was to stand on its summit, then the greater part of their anatomy had attained the required altitude. The conclusion being that the peak might be counted as a Twenty-Five if when standing on the top, the person should leap at least one foot into the air. The 1912 article set a precedent that many a hill list author over subsequent years would follow, as it is the first update to a hill list that ever appeared, it would not be the last to the list known as the ‘Twenty-Fives’, but for that we will have to wait another seventeen years. After Corbett’s 1912 update to his original list fourteen years were to pass before the next list appeared. Up until 1925 no attempt had been made to write a comprehensive account about a specific British mountain district. ‘The Mountains of Snowdonia’ remedied this, and weighed in with an all-consuming 400 plus pages. Scattered throughout with foldout maps and black and white photographs, it was published by John Lane The Bodley Head Limited of London. The book comprises four parts and appendices. Part one deal with the historical aspects of Snowdonia; part two the scientific; part three has two chapters on literature; whilst part four concerns itself with sport. Almost hidden away on page 385 within appendix two is a table to ‘The mountain peaks of Snowdonia – 2000 feet in height and over’. The table is split into five groups of which Snowdon is the first, comprising seven peaks; the Glyder group follows with eleven peaks; fifteen peaks make up the Carnedd group; seven the Moel Siabod group; and lastly the Moel Hebog group with nine peaks. In all forty nine mountains are listed, twenty two of which had never appeared in a comprehensive hill list before, and remarkably all twenty two would, in time, qualify for Nuttall status (refer to 1989 publication). Even more remarkably, nineteen out of the twenty two would, in time, qualify for Hewitt status (refer to 1992 and 1997 publications). Welsh luminaries making their first list appearance include Yr Aran, Pen yr Oleu-Wen (Corbett’s listing was for two points on a lower ridge), Creigiau Gleision, Moelwyn Bach, Allt Fawr, Cnicht, Craig Cwm-Silin, Trum y Ddysgl and Mynydd Mawr. Each mountain in each group is listed in order of altitude, followed by the peak’s name, English signification, height in feet, order in altitude and finally map reference. The authors of this weighty tome were Herbert R.C. Carr and George A. Lister. Carr and Lister state that in attempting to compile the list, they met at the outset with the difficulty of defining a mountain peak. The basis of their chosen criterion was that a peak should only be included, if it rose by more than 100 feet above the lower ground connecting it with any greater height. They go on to say: “Though we have been forced to admit one or two exceptions”. Thus, although trying to apply a strict re-ascent rule Carr and Lister became somewhat arbitrary, take Mynydd Perfedd in the Glyder group; - this mountain is included even though the authors knew it had only 55 feet of re-ascent from its connecting col with Carnedd y Filiast. The authors omit Bera Mawr, Bera Bach, Gyrn Wigau and Drosgl, all within the Carnedd group, as they are merely points on continuously rising ground. As a whole, this book was a huge undertaking, and over three quarters of a century after its publication it can still be used as a source for detailed information. The one page within the book that concerns this article breaks new ground in attempting to use a re-ascent criterion of 100 feet and lowering the minimum height criterion to one of 2000 feet, which to the present day is generally accepted as the lowest elevation of a mountain in Wales. It would be another fifteen years before a comprehensive list to the whole of Wales was published using this height criterion. Before we meet the instigator of this list we first have to acquaint ourselves with J.A.Parker. In 1929, two articles of interest to our story were published, both related to the same subject. One consisted of two pages, entitled ‘The Scottish Threes (contd.) and after’ and was published in the Cairngorm Club Journal No.68. But of greater importance, and the one we shall concentrate on, is the more detailed eight page article published in the Scottish Mountaineering Club Journal, entitled ‘Beinn Tarsuinn and the British Threes’. The author of both articles was James A.Parker, whom we have briefly met as the third person to complete the Munros. It was Parker’s objective to climb all the British Isles separate mountains over 3000 feet. These became known as the ‘British Threes’. Parker takes up the story of his last Munro: “I climbed my last Munro, Ben Hope, on the 19th July 1927 – at least, I believed that it was the last”. “In October 1928, I learned to my chagrin that an alleged 2970 foot Scottish mountain had grown to the extent of about 110 feet, and had thereby acquired the rank of a Munro”. “The hill is, of course, Beinn Tarsuinn”, hence the title of his article. After climbing Beinn Tarsuinn, and verifying that the mountain was, in fact, over 3000 feet, Parker turned his attention toward the remainder of the British Threes. This culminated in him spending a week in Wales, during the Easter of 1929. At this stage, the Welsh Threes were known to contain fourteen summits over 3000 feet, two of which, Foel Grach and Crib y Ddysgl, in Parker’s opinion, could not be classified as separate mountains. Parker passes comment on the three distinct groups, the Carnedds, the Glyders and Snowdon. The Carnedd group: “Consists of a long ridge about 7 miles in length, with six 3000 foot tops, two of which – Carnedd Dafydd and Yr Elen – have very fine northern sides. The summit ridge affords a very delightful high level walk over quite easy ground, and must command magnificent views in clear weather. Smoke from the Midlands, however, is apt to be common, and is almost as bad as the smoke from a Canadian forest fire”. “The next group, the Glyders, containing five 3000 foot summits, presents stoney or grassy slopes to the south and a magnificent range of precipices to the north. The highest point is Glyder Fawr, and the most interesting one is Glyder Fach, with its famed masses of huge stones on the summit and its very fine north-east ridge running out to Tryfan”. “Snowdon itself is magnificent, and in its east and north faces has few rivals outside of Skye. The round of the horseshoe is fascinating, that is, up the east face of Crib Goch and along its knife edge arête and pinnacles to Crib y Ddisgl and Y Wyddfa, and then back along the narrow summit ridge of Lliwedd”. Under the heading of appendix II, Parker’s ‘List of the mountains in the British Isles 3000 feet or over in height’, appears on the last page of his article. In all, twenty three separate mountains outside of Scotland are listed, with their respective heights. England has four mountains, Wales twelve and Ireland seven. By 1921, Munro’s Scottish list of separate mountains had been revised to 276, with the addition of Beinn Tarsuinn it now stood at 277. With Parker’s additional twenty three British Isles 3000 foot mountains, the total reached a rounded 300. On the 19th April 1929, James A. Parker ascended his final 3000 foot separate mountain within the British Isles, thus becoming the first person to achieve this particular challenge, his chosen 300th and last mountain was Tryfan. The Welsh part of Parker’s list is but a microcosm within a much varied picture of Welsh hill lists. Historically it and its similar, later counterparts are important for comparing Wales’s highest peaks with their contemporaries in Scotland, England and Ireland. To ignore the separate 3000 foot category would be doing an injustice to the history of Welsh hill lists. As we will see, in the upcoming years, important changes in criterion use, listing of hills and book format will be led by this particular category of hill list. Only eighteen years had passed since Wales’s first comprehensive listing of mountains appeared, and already the three standard designated minimum height criteria; Corbett’s 2500 feet, Carr and Lister’s 2000 feet and now Parker’s 3000 feet, had been established. These three heights would dominate hill lists for the next five and a half decades and beyond. It would take another fifty five years before a Welsh hill list was published that chipped away at these three’s dominance over the designated minimum height criterion. But, that is for the future, for now, we have to re-visit our old friend John Rooke Corbett. The first page comprises an introduction with the last three pages relating to Wales. The Welsh list is split into six groups with a brief description of each followed by the mountain’s name and height, in all three mountains are deleted from the 1911 list, whilst ten mountains are added. Of particular interest is the addition of Cader Berwyn, S. Top which was mapped at 2650 + feet, it would be almost sixty years before this particular mountain was recognised by published list compilers and the Ordnance Survey alike as being the highest point of the Berwyn, eventually receiving the designated map height of an 830 metre ring contour (2723 feet), and eighty five years since this hills first appearance in a list before its accurate height of 832.0m was obtained by using a Trimble GeoXH 6000. Corbett’s criterion for inclusion depended upon each top being indicated by a separate contour ring, but also retained were a few others, whose summits Corbett remembered as distinct tops. By using this criterion Corbett is open to including certain tops that have less re-ascent, than other tops, which are omitted. But by compiling this list from map details with contour intervals of 50 feet, Corbett had taken the first step toward this prescribed height being used as the designated minimum re-ascent criterion for many a future list compiler. Corbett’s updated list ushered in the 1930’s. These years saw the least amount of Welsh hill list publication in any decade from 1911 to the present day. The only list concerning Wales to be published was another update to Corbett’s Twenty-Fives. This was published in 1933 in the Rucksack Club Journal, and entitled Some New Twenty-Fives. It comprised two pages, of which the first page is introductory as well as listing the latest updates; these consist of ten additional Twenty-Fives, of which six are in Wales. Of particular note is the first ever listing of the southern top of Arennig Fawr which was listed as Arenig Fawr Far South top. The remaining page gives brief details on the six new Welsh tops. There were now 158 Twenty-Fives with sixty four of them in Wales. This now brought to a conclusion the updates to John Rooke Corbett’s original 1911 list, the author of this latest update we’ll meet later, in 1939/40, but first our story takes us into England, where between the years 1933-1939 three lists were produced, with the latter two paving the way for the first comprehensive published listing to the 2000 foot mountains of Wales. The first of the three was compiled by the Rev. W. T. Elmslie, entitled ‘The Two Thousand Footers of England’, comprising 347 mountains and published in 1933 by the Journal of the Fell and Rock Climbing Club of the English Lake District. Following this in 1937 was the Wayfarer’s Journal’s publication of F. H. F. Simpson’s ‘Concerning Contours’, comprising the 225 English Lake District 2000 foot tops. Two years later the Rucksack Club Journal published ‘The Two Thousands of England (excluding the Lake District)’, this listed 152 tops and complemented Simpson’s 1937 list. When combined the two lists produced a mammoth total of 377 English 2000 foot tops. The author of the 1939 list and the Twenty-Fives update of 1933 was Edward (Ted) Moss. 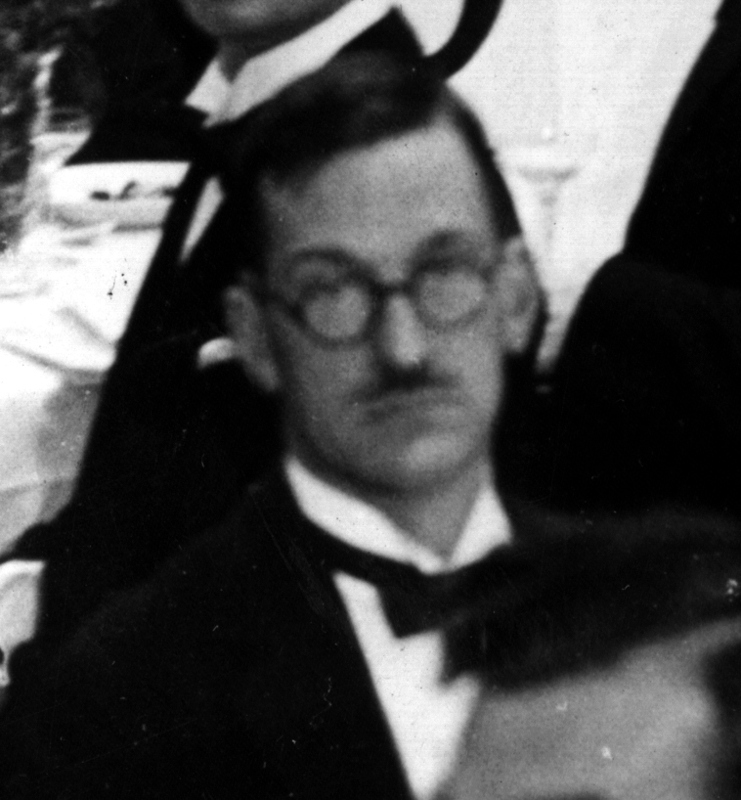 Ted Moss was a Textile Research Chemist during his years of list compilation. With his 1939 publication the English list was now complete. Moss then turned his attention to Wales, the result appeared one year later in the 1940 edition of the Rucksack Club Journal. Entitled The Two-Thousands of Wales, it consisted of five pages and proved to be the first published comprehensive list of the 2000 foot mountains of Wales. Moss used the same criteria as his 1939, and Simpson’s 1937 English lists, that is, all tops of 2000 feet and over marked by a separate contour ring on the one-inch Ordnance Survey Popular Edition map. In addition, a few tops not honoured with a separate contour ring but which had distinct rises were also included. This followed Corbett’s single contour ring criterion of 1929 but with one important difference, Moss followed his own 1939 English list where he divided the mountains into major tops and minor tops. Of the 237 mountains listed, thirty seven were identified by Moss as minor tops; these were represented in their respective group listing in italics and inlayed from the text margin to separate them within the text from the other 200 major tops. By doing this Moss harkens back to Munro with his separate mountains and subsidiary tops. 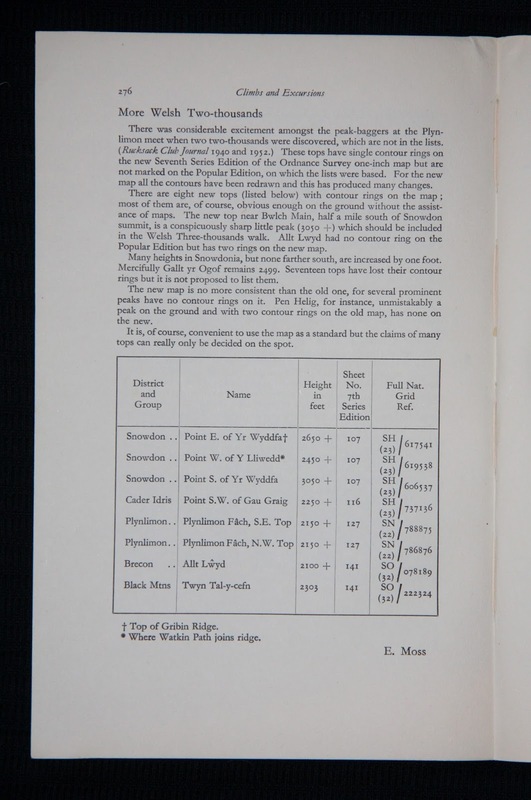 After a half page introduction the listing starts with the name of mountain group and number of tops within each group, the latter being in brackets, followed by the mountain’s name, height and O.S. reference. In all seventeen groups are listed, of which the Carnedd Group with twenty nine tops appears first, eight are listed as minor tops. Making their first appearance in any published hill list are Carnedd y Ddelw, Drosgl, the northern top of Creigiau Gleision and Craiglwyn which is listed as Creigiau Gleision Point S (ii). Next is the Glyder Group which comprises fourteen mountains, four of which are minor tops. The Snowdon Group follows with the first list appearance of Foel Gron, Llechog and Gallt y Wenallt, Moss lists all ten tops as major. Eleven mountains make up the Nantlle Group, of which one is listed as a minor top; Y Garn is listed for the first time. The Festiniog Group comprises eleven major and three minor tops with new appearances in published form by Ysgawell Wen, its southern top which is listed as Ysgawell Wen Point S, Moel Penamnen, Graig-ddu and Manod Mawr which Moss lists as Clogwyn Candryll. The first group that Moss opens up is the Arenig Group which he lists as having twenty five tops, only two points in this group had ever appeared in a published list before, one being Arenig Fawr, Moss’s group consists of fourteen major tops and eleven minor, entering a published hill list for the first time are Foel Goch, Carnedd y Filiast, Waun Garnedd y Filiast which Moss lists as Carnedd y Filiast Point N.E., Carnedd Llechwedd Llyfn is listed as Gylchedd, Arenig Fach, a top to the south of Arennig Fawr which is listed as Arenig Fawr Far S. top Point S (i), Moel Llyfnant, Gallt y Daren, Foel Boeth, Dduallt and Rhobell Fawr. The third page of the article continues with the Rhinog Group comprising eight major and three minor tops, none of which had ever appeared in a published list. Twenty five tops make up the Berwyn Group, of the sixteen major tops and nine minor tops the following mountains are all new published listings: Moel Fferna, Cefn Dylif which Moss lists as Blaen Llynor Point N, Tomle, the southern top of Foel Wen which is listed as Foel Wen Point S.E., Mynydd Tarw, Godor, its northern top named Godor Point N.W. and finally Post Gwyn. The ninth group is the most extensive with nineteen major tops and ten minor tops making up the Aran Group. Only four of the twenty nine tops had ever been listed in a publication, all of the heather bound Hirnant hills were making their first appearance in a published list, other newcomers include Foel Rhudd, Llechwedd Du named Craig Ty-nant by Moss, Foel Hafod Fynydd listed as Craig Cwm-du, Pen yr Allt Uchaf listed by Moss as Drysgol Point S., Gwaun y Llwyni named Camddwr in the list and lastly Waun Camddwr which Moss lists as Camddwr Point W(ii). The list continues with nine major tops in the Cader Idris Group, Gau Graig, Tyrau Mawr named Craig Las by Moss and Craig y Llyn all make their first entrance into a published hill list. The Corris Group consists of what are sometimes referred to nowadays as the Dyfi Hills and Tarrens, Moss lists five major tops and three minor ones, none had entered a hill list publication before. Moss’s next listing was to the Plynlimon Group, nine tops in all with just one listed as minor, none had appeared in a comprehensive published hill list. The thirteenth group comprised the wilds of central Wales with both Drygarn Fawr and Gorllwyn receiving their first ever published listing. Another four listings made up the Radnor Forest Group. Moss now lists South Wales with thirteen tops within the Fforest Fawr Group; only one point is listed as a minor top and only one point, Fan Brycheiniog which Moss lists as Carmarthen Van had ever appeared in a hill list publication before. The penultimate listing is to the Brecon Group which comprises eleven major and one minor top, appearing in published format for the first time are Y Gyrn, Fan y Big which is listed as Craig Cwm-oergwm, Craig Gwrelyg listed as Craig Cwareli and the hill often listed as Cefn yr Ystrad which Moss lists as Unnamed Top. The last group comprises eleven major tops in the Black Mountains, except for Waun Fach and Pen y Gadair Fawr, none had ever been represented in a published hill list. Even though many peaks would disappear from future compilations, Ted Moss’s 1940’s list proved to be the first listing of the 2000 foot mountains of Wales to be published. 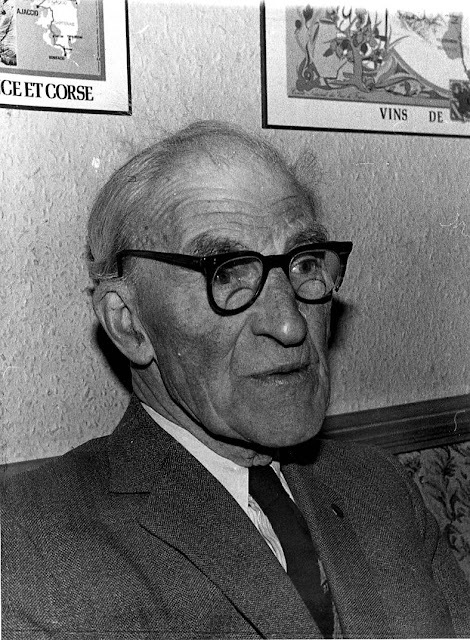 After completing Simpson’s list on the 2nd May 1947, Ted Moss became the first known person to complete his list of the 237 Welsh Two-Thousands, when on the 10th August 1950, his notes of the day record, he completed a six hour, ten mile walk incorporating 4000 feet of ascent over eight hills within the Fforest Fawr group. Ted Moss later completed his 1939 list and thus became the first person to finish the 612 combined 2000 foot mountains of England and Wales (614 when the totals of the two countries are combined, but because of the position of the border as it crosses the Black Mountains, Moss purposely included two mountains in each list), when on the 22nd July 1951 he completed six hills within the Swaledale and Mickle Fell groups, although, as with his Fforest Fawr walk of the previous year, his notes of the day do not confirm his 612th and last mountain. The mountains visited are known but not in what order, the firm candidate for this honour, though, is Bink Moss. Wouldn’t it be more than appropriate if this was so? Ted Moss’s 1940 publication ‘The Two-Thousands of Wales’ is a fitting culmination to the end of the first part of the history of Welsh hill lists. Already three important designated minimum height criteria had been used and a 100 foot minimum re-ascent value had been attempted. Yet, what published list compilers had not attempted, but were working toward, was a minimum re-ascent value of 50 feet. That is, until our next author and publication. But this is another ten years away, and will be dealt with in the next part of The History of Welsh Hill Lists. During analysing the previous listings in this article two aspects became evident in how a list compiler defines a mountain. The first is the minimum designated height - Corbett chose 2,500 feet, Parker 3,000 feet, whilst Carr and Lister and subsequently Ted Moss chose 2,000 feet. The second aspect used in defining a mountain is its separation from adjacent ground - Carr and Lister attempted a classification based on a minimum of 100 feet of ascent from the mountains connecting col to any higher ground, this is sometimes referred to as the minimum re-ascent rule within the pages of this article, Corbett and Moss chose a definition depending upon a single ring contour at a 50 foot interval. By choosing this 50 foot contour option their resulting lists were open to include inconsequential rises. Moss’s quoted reference to the two Craig Berwyn tops sums up this problem, but by emphasising the chosen contour to be one of 50 foot they had taken the first step toward this designated height being used as a minimum re-ascent rule. After Ted Moss’s 1940 publication another ten years were to pass before this criterion was eventually used in a published article. The first person to use a minimum re-ascent criterion of 50 foot as a basis of a Welsh hill list and have his detailed findings published, is little known and almost lost in the annals of time. His name is Arthur St. George Walsh. Walsh was born on the 23rd April 1893, the middle part of his name given him because of the day of his birth, St. Georges day. His father; John Leopold Walsh, was to become a bank manager at Alderley Edge, whilst his mother; Frances Eliza Crompton, continued to use her maiden name as the author of twenty nine children’s books. His parents had seven children, with Eleanor Elizabeth, his sister, dying in infancy. Walsh grew up the eldest amongst his remaining five brothers and sisters. After leaving Stockport Grammar School he won a scholarship to Trinity College, Cambridge, where he studied mathematics. This helped in giving him the grounding in methodical detail that was all too necessary in what Walsh was later to attempt. 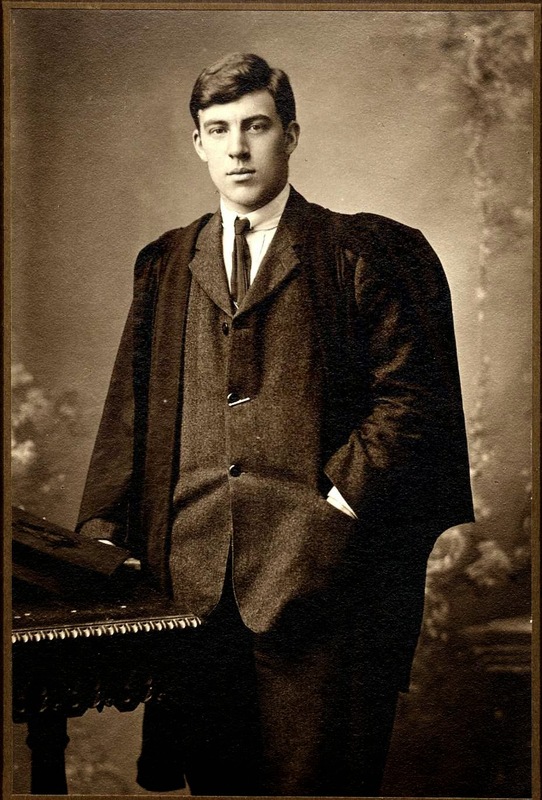 When the First World War broke out, he was still studying at Cambridge. Applying for a commission at Christmas time 1914, he was gazetted a 2nd lieutenant in the 15th Battalion of the Manchester Regiment on the 22nd March 1915. Walsh later became a Captain and served in the Middle East (photographs showing him climbing Mt Hermon and trekking through the Sinai desert still exist), France and finally the Dolomites. Walsh was transferred to the Dolomites from what was to become the slaughter of the Somme, something he believed saved his life, as well as providing him with good climbing experiences. After the war he resumed his education at Trinity Hall. His first appointment after leaving college was as a schoolmaster teaching mathematics at Cambridge High School. In 1925 he moved to Kings School, Chester, where his career as a Maths Master began. One of his pupils during the late 1920’s was to form an integral part in the story of Mr Walsh and his hill list; the pupil’s name was Walter Slowing Matthews. During this time Walsh and his brother Roger Crompton, or ‘Skip’ as he later became known, (Roger became the leader of his local Chelford Scout troop, hence the name Skip) were Top collecting with the aid of the late Victorian ‘Baddeley’s Guide to the English Lake District’. Arthur and Roger then came upon Carr and Lister’s use of 100 foot rise as the main qualification for their list of 2,000 footers of Snowdonia. Soon afterwards the Walsh brothers decided to make their own lists for England and Wales, using a 50 foot rise as part of their criteria. Walsh’s original list probably materialised in the late 1920’s, certainly no later than the early 1930’s. Thankfully Arthur Walsh hand wrote a copy of his and Roger’s hill list and gave it to Walter Matthews, as by this time Walsh was leading parties of King’s School pupils out to the hills. These expeditions continued through the 1930’s. With the outbreak of the Second World War hill expeditions were curtailed. During this time Walsh found work, of a national importance with the Forestry Commission, outside of his teaching. After the end of the war, Walsh’s hill walking parties resumed, mainly made up of ex-King’s School Chester men. It was on one of these meets that a young schoolboy, Walter Matthews’s son, David, first met ‘Mr. Walsh’. David although still very young could certainly not be described as ill experienced amongst the hills, as his father had led him up his first mountain, Rhinog Fawr, in July 1948 at the age of 3 years and 10 months. It is David Matthews who, along with his father Walter, share responsibility for the survival of Arthur St. George Walsh’s hill list. 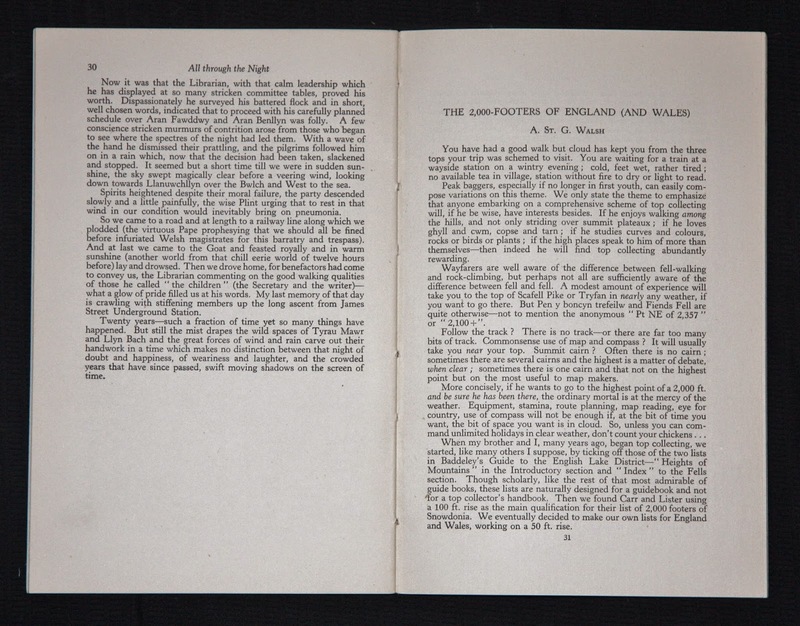 Within the 1950 edition of the Wayfarers’ Journal Walsh published a seven page article entitled The 2000-footers of England (and Wales). He categorises the mountains within his list into three classes, and explains why; “The trouble of course is that often there is no means of determining whether the drop is more or less than 50 feet, short of taking a tame surveyor (plus instruments) around with one”. In view of this Walsh devised his three classes, namely; ‘definitely 50 ft drop, marked with a tick √’, ‘doubtful, marked with a question mark ?’ and definitely not 50 ft drop, marked with an x’. Walsh’s Welsh part of his list evolved over time from investigating all spot levels given on the Ordnance Survey one-inch Coloured Edition map which had contours at 250 foot intervals, all spot levels given on the Ordnance Survey one-inch Popular Edition map which had contours at 50 foot intervals, all points which seemed possible on the ground and all points given in Carr and Lister’s 1925 publication and Ted Moss’s list of 1940. For the purpose of convenience, Walsh splits all 2,000 foot country into three areas, these are; Lakes (including Isle of Man), Wales (including Black Mountains and Dartmoor) and Pennines (including the Cheviots). Within the scope of this article I will refrain from the temptation of annexing Dartmoor on behalf of Wales and will proceed to quote all reference to Wales within Walsh’s article to the country of Wales and not Wales plus Dartmoor. Walsh then splits each area into sections via dividing lines that represent railways or roads. The third page of the article has a representative Welsh area within which is Walsh’s sections. These are given letters from A-P, for example, section D’s boundary lines connect Caernarvon, Rhyd-ddu and Penygroes, Table 1 on the fifth page of the article has only one mountain listed in section D. This is categorised in Walsh’s classes with a tick, the mountain in question is Mynydd Mawr which Walsh classifies as having definitely 50 foot drop, the process is repeated for each mountain in each section, it works remarkably easily. The article continues with Walsh’s Table 1, which is a finished tabulation of numbers of mountains in each section and each class, a representation of this Table will follow shortly. The article finishes with a further three Tables. Table 2 details the Ordnance Survey and previous list data. Table 3 shows Walsh’s detailed workings to the Pennine area; section H in the English part of his list. Lastly Table 4, the ‘summary of 2,000 ft lists’, this itemises Walsh’s overall figures for his Lakes, Wales and Pennine areas. A representation of the Welsh part of Walsh’s Table 1, which is a finished tabulation of numbers of mountains in each section and each class, follows. The Table is as Walsh’s, except that for ease of reference I have included the title of each class and mountain group name for each section, these have been inserted between brackets to distinguish them from Walsh’s original Table, also included are Walsh’s totals from his list that he gave to Walter Matthews in the early 1930’s, again these have been inserted between brackets to distinguish them from Walsh’s 1950 numbers, the details concerning the early 1930’s list and its totals are explained after the Table. The only part of Walsh’s list that has ever been published is the workings to his Section H, in the Pennine area, which was reproduced in his Table 3. This is meticulously detailed and takes the reader through the process of how Walsh determined his six definitely 50 foot mountains and his eight definitely not 50 foot mountains for this particular section. Although it is unknown if such thorough and detailed workings ever existed for each of Walsh’s sections, my suspicion is that they did, and that the tantalising details of his workings for the Pennine area, Section H, were not just produced for the benefit of his Wayfarers’ Journal article. I suspect this was just a segment of his overall workings and was only published to show the reader how Walsh had arrived at his conclusions. Although a few brief notes of Walsh’s on the ground findings are still in existence, it is one of the great tragedies of Welsh hill list history that the great majority of Arthur St. George Walsh’s detailed workings to his list no longer exist. Extensive and exhaustive research has led me to believe that the only part of his actual list to survive is that which he hand wrote and gave to Walter Matthews in the early 1930’s. This now exists only in typed format, something that Walter Matthews instigated in the early 1950’s. The typed list is an exact copy of Walsh’s list of the early 1930’s. The only other option for copies of Walsh’s list to still exist would be with other King’s School children who accompanied him on his many hill outings. The details of his early 1930’s list are as follows. The list is made up of twenty five A4 sheets of paper, with five sheets for the Pennines, nine sheets for Wales with the Lakes incorporating ten sheets and lastly the Isle of Man one sheet. Each sheet is entitled “Mountains of England and Wales 2000″ +”. Details include Walsh’s designated ‘section’ and the mountains incorporated within, with their ‘height’, if their top was assigned with a ‘cairn’ or not, ‘date’ of ascent and lastly space for ‘notes’. Each of these appears in column format. No Ordnance Survey or grid reference detail is given. Therefore we have two sets of numbers, one from the early 1930’s and one from Walsh’s 1950 article. This now leads us on to unpublished lists, of which Walsh’s is the first, but certainly not the last, that we will deal with within the context of this article, and there lies the problem. This article’s brief is to analyse hill lists in a chronological order. The problem we face is when to date an unpublished list. Published lists are obviously easy to date, as although many months, if not years of collation and work has gone into the list, the date is set by the publication date. Whereas most unpublished hill lists evolve over time, Arthur St. George Walsh’s is no exception. I have decided that as Walsh’s findings appeared in a published article it would be more appropriate if the early 1930’s list was analysed at the same time as his 1950 article. Although many unpublished works are only updated when details concerning new heights on ever more detailed maps arise, Walsh’s list is one of the rare exceptions, as he, his brother Roger and a select few of the ex- King’s school participants of Walsh’s hill walking parties were surveying these mountains on the ground, attempting to ascertain if the designated bump did or did not have the required 50 foot of rise on all sides to be included in his ever developing list. What are uncertain are the surveying techniques Walsh and his colleagues employed. The probability is that they relied upon subjective on the spot judgment. If so, accurate measurements were difficult to attain, but detailed analysis of their various promotions and demotions lead me to conclude that many were remarkably correct. By relying not just upon map data but also on the spot surveying of hills, Walsh’s totals were ever changing, as can be seen in the forthcoming representation of Walsh’s Table 1. The overall numbers in the definitely 50 foot class are remarkably similar between the 155 in the early 1930’s list and the 154 in Walsh’s 1950 article. Eleven out of Walsh’s sixteen sections match exactly with only Section K – to the Berwyn mountains being out by more than one. Between the list’s origination and its published 1950 tabulation Walsh had continued his on the spot surveys and therefore an occasional top would be promoted or demoted between the three classes. Comparing the two sets of numbers in his doubtful class is different. Whilst fifty nine are listed in his 1950 article, only fourteen received this classification in his early 1930’s list. Seven of these are listed with one question mark ‘?’ after the mountain’s name, with six receiving two question marks ‘? ?’ following their respective name. One other; Llechwedd Llyfn, which Walsh names Gylchedd S.W. has ‘(probably)’ inserted in brackets after its name, this mountain is in part of the Arennig, Walsh’s Section H. I have taken this as being classified in his doubtful class but ‘probably’ awaiting promotion to his definitely 50 foot class. My suspicion is that the fourteen hills given ‘doubtful’ classification in his early 1930’s list were either the only ones Walsh had visited and therefore recorded up until giving a handwritten list to Walter Matthews or that Walsh had by this stage visited the great majority of his doubtful classification and only fourteen were considered for possible promotion to his definitely 50 foot class. I consider the former of these two options to be nearer the truth, as we know Walsh and his colleagues were still surveying mountains after his 1950 article had been published. The two sets of numbers in the definitely not 50 foot class are vastly different, ninety two in his 1950 article and only one in his early 1930’s list, and even this one is slightly contentious. The mountain in question is Y Garn, at the end of the Nantlle Ridge and in Walsh’s Section G. The mountain’s name is in brackets and has ‘not a top’ typed after it. 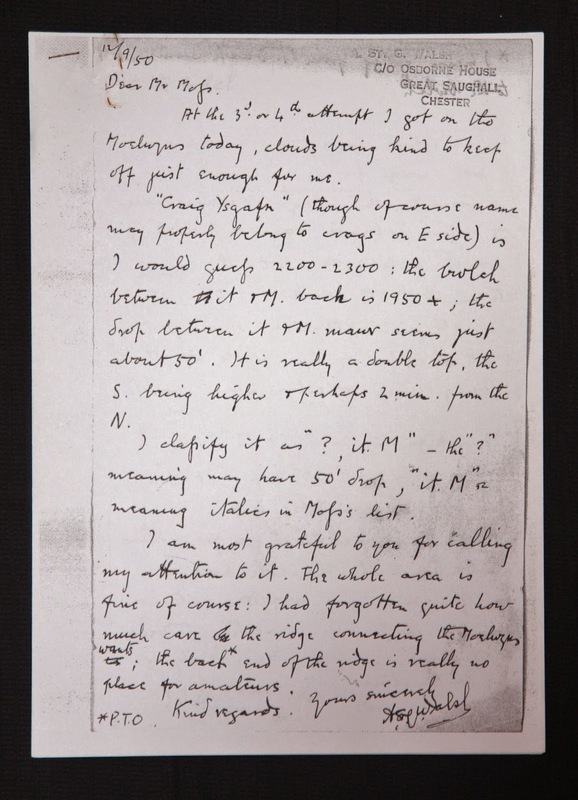 Walter Matthews has added a handwritten question mark following the ‘not a top’, possibly inferring that the question mark was missed during the typing of the handwritten list. It is slightly contentious on my part to include this mountain in this class as the lack of a typed question mark is probably a typographical error and the mountain considered as a doubtful. But whilst analysing Walsh’s list I have endeavoured to be consistent, this is why I have strictly adhered to the typed list and included Y Garn in the definitely not 50 foot class in Walsh’s early 1930’s list. The remaining ninety one in this class are not in his early 1930’s list as there was no reason to do so, as in Walsh’s opinion they had definitely not reached the 50 foot of rise on all sides needed for inclusion within his actual list. There are no dramatic revelations of new found mountains in the Welsh part of his late 1920’s, early 1930’s list. These would have to wait until the more detailed metric mapping of the mid 1980’s. What the list does show us is how reliant a list compiler is upon the tools of their trade – these are the maps of the day. The one-inch Ordnance Survey maps of Walsh’s day were renowned for occasional glaring inaccuracies. Sometimes a mountain that was obviously there on the ground did not possess any ring contours on the map, and if the weather was inclement and the visibility obscured, the hill walker/peak bagger of the day would have no means of knowing that the continuing downward slope did in fact begin to rise quite dramatically only another quarter of a mile or so further on. These glaring errors were all too frequent. Examples of these can be seen in the forthcoming Table A.
Walsh relied upon the accuracy of the map as any other list compiler would. Therefore mountains that we now know do not possess the 50 foot of rise on all sides required to enter his list, were included because the one-inch map had, in fact, given them two contour rings and, therefore, supposedly at least 50 foot of rise on all sides. Examples of these can be seen in the forthcoming Table B. Even some of these, in time, were queried on the ground as Walsh and, latterly, Walter Matthews worked their way through the mountains in the doubtful class. Walter Matthews’s part in the progress of Walsh’s list will not be discussed just yet. Although an integral part in the survival of the list and its developing changes, we will wait another twenty three years before discussing in detail Walter Matthews’s part in ‘Mr. Walsh’s’ list. The likelihood is that Arthur St. George Walsh’s list is the earliest comprehensive listing to the 2,000 foot mountains of England and Wales and pre-dates Ted Moss’s workings to ‘The Two-Thousands of England (excluding the Lake District)’ and ‘The Two-Thousands of Wales’ by possibly four to seven years. Moss’s two lists were published in 1939 and 1940 respectively. With their respective pre-publishing workings probably taking place from the mid 1930’s onwards. Because of this list’s historical significance and as it remains unpublished in its entirety and, therefore, not in the public domain, it is worthwhile detailing in depth two aspects of its Welsh content. Mountains that have at least 30 metres rise from their connecting col to the next higher ground but are not included in Arthur St. George Walsh’s Welsh part of his late 1920’s, early 1930’s list. No.107. 1947 Edition 1 Ring Contour. No.117.1963 Edition. 2 Ring Contours. Tops that do not have the required 50 foot rise on all sides but are included in Arthur St. George Walsh’s Welsh part of his late 1920’s, early 1930’s list. Table A would lead us to conclude that Walsh had overlooked nine prime candidates for inclusion. This he did, but on closer inspection all save one have a valid reason for being overlooked. Carnedd Uchaf, Cyfrwy and Gau Graig all possessed only one continuous uppermost contour ring on the old one-inch map. Each of these three peaks was listed with two question marks ?? following their name. This probably means that Walsh initially listed these in his doubtful class but considered them as very strong candidates for promotion to his definitely 50 foot class. Throughout the list only six peaks are given two question marks ?? after their name. The three remaining peaks not listed in Table A are: Rhos, which Walsh calls Rhos W, Bryn Gwyn which he lists as WNW of Post Gwyn and lastly Corn Du. The first and second peaks are in the Berwyn whilst Corn Du is in the Brecon Beacons. The two Berwyn peaks have handwritten notes made by Walter Matthews saying they are; ‘almost certainly not’ and ‘not a top’ respectively, whereas Corn Du is treated the same as the three peaks in Table A; the question marks remain unaltered and no adjoining notes are made. This implies that upon inspection Walsh and Walter Matthews had accepted these four peaks; Carnedd Uchaf, Cyfrwy, Gau Graig and Corn Du, into the main part of the list, whilst Rhos and Bryn Gwyn remained outside of the definitely 50 foot class. Two mountains within Table A do not possess any ring contours on the one-inch map, both are in the Aran. The first we will deal with is Esgeiriau Gwynion. This mountain has Foel Rhudd as a close neighbour, but overshadows this peak by a significant twelve metres (39 feet). Walsh tantalisingly lists Foel Rhudd as Foel Rhudd NE, inferring he knew another peak existed to the South-west, but no mention of it was made. The second peak within Table A that possessed no contour rings is Pen y Brynfforchog, the maps of the day gave a spot height of 2,149 feet, this Walsh lists as – (W. of Bwlch Fign). This point is now spot heighted as 656 m and is over 0.5 kilometres from the true summit of Pen y Brynfforchog which is another 29 m (95 feet) higher. Another top of note but not listed in Table A is Cefn Gwyntog in the Berwyn. Again this mountain received no contour rings on the one-inch map, the only point of reference being over one kilometer away to the North, this Walsh lists quite rightfully with a question mark and calls E. of Py B.T., the name given by Walsh refers to Pen y Boncyn Trefeilw which is a near top to the West. Three of the nine mountains in Table A are not mentioned at all by either Walsh or Walter Matthews – Esgeiriau Gwynion and Pen y Brynfforchog being two, the third is the highest point of the Berwyn. This peak was first listed by John Rooke Corbett in 1929 and named Cader Berwyn, S.Top. Recent local enquiries conducted by Myrddyn Phillips and Aled Williams in the vicinity to the west and east of this mountain suggest that the name of Craig Berwyn is the favoured local name for this peak. This particular peak was an obvious candidate for inclusion but probably overlooked due to it only having one ring contour on the one-inch map, an understandable oversight on Walsh’s part. Another peak only assigned a single ring contour on the one-inch map and missing from the list given to Walter Matthews is Fan y Big, in the Brecon Beacons. Walsh’s initial oversight was soon rectified by its later inclusion by Matthews who called this top Craig Cwm Oergwm N.
Now on to two peaks in the southern Berwyn, the first of which is Foel Goch, this is listed by Walsh as Im. NNE of F.y.Geifr, this name refers to Foel y Geifr which is to the South. This is rather a contentious inclusion within Table A on my part as a typed question mark follows the mountain’s name. The question mark then received a crossing out by Walter Matthews, probably inferring that this top was included within the initial definitely 50 foot class and the typing of the question mark a mistake, rectified by Walter Matthews’s crossing out. As mentioned before (in the case of Y Garn on the Nantlle Ridge) whilst analysing Walsh’s comparable numbers in his definitely not 50 foot class, I have endeavoured to be consistent and therefore have strictly adhered to the typed part of Walsh’s list. Lastly we come to Foel Cwm Sarn Llwyd which possessed six continuous uppermost contour rings on the one-inch map but was not included within the typed part of the list, suggesting it was missed by Walsh in the list’s initial compilation. If this was so it was a glaring oversight but one which was soon rectified as it was later added by Walter Matthews under the name E. of Nant y Sarn. Table B is somewhat different as seven peaks are listed by Walsh that with more detailed mapping we now know do not fulfill the specified criteria of having 50 foot rise on all sides. Six out of these were allocated two ring contours on the one-inch map and, therefore, supposedly a minimum of 50 foot of re-ascent. The seventh peak we will deal with is listed by Walsh as Waen Rhydd S, this is towards the eastern end of the Brecon Beacons ridge and was only allotted one small ring contour and a spot height of 2,502 ft on the one-inch map. This point only has an approximate 15 ft of rise from its connecting col to the higher Waun Rydd, which Walsh calls Waen Rhydd N, of which the Ordnance Survey gave a height of 2,504 ft on the one-inch map. It is quite incredulous that Waen Rhydd S has been included and seemingly wasn’t demoted by either Walsh or Matthews. With sixteen peaks listed in the two Tables, Waen Rhydd S is the only one from the Welsh part of his late 1920’s, early 1930’s list that lacks an obvious explanation. All others, with the provision of Walter Matthews’s later updates, have a valid reason for either being excluded or included. One out of 164 (155 in the typed list and nine from Table A) isn’t that bad as most list compilers find at least one unexplainable oversight occurs in the collation of any hill list. It is probably correct to say that Walsh’s list is the earliest comprehensive list to the 2,000 foot mountains of England and Wales. The list is little known and in its own right quite extraordinary as it is the first to use 50 foot as the designated minimum re-ascent value, something that up until the present day is regarded by many people as the accepted re-ascent value for a mountain in Wales. Walsh was revolutionary in his use of a thorough and systematic, although perhaps subjective, approach to surveying hills on the ground. It is easily one of the most important Welsh hill list’s that has ever been produced and yet the actual list has never been published. Although the list survives, it is somewhat perturbing to think that the great majority of Walsh’s detailed workings are now lost, as what we have is a list that is literally decades ahead of its time, as Walsh’s late 1920’s, early 1930’s list will not be matched in its use of a simplified yet thoroughly checked-out criteria for almost another sixty years. The thought that the detailed workings to the list are now lost and the name of Arthur St. George Walsh is almost forgotten, is lamentable. The man and the list deserve much more recognition. Because of its first use of 50 feet as the minimum re-ascent value, Arthur St. George Walsh’s 1950 list was ground breaking and so, in its own small way was our next publication; ‘Hill Walking in Snowdonia’, by Edward George Rowland. Until now, the great majority of hill lists were somewhat restricted in their availability and hence their readership. 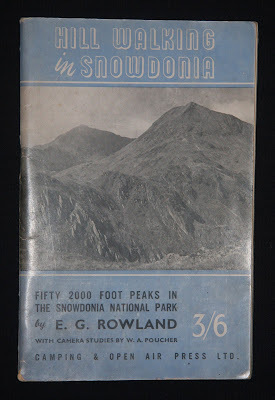 E. G. Rowland’s publication was widely available and became the first book to the Welsh mountains that incorporated a series of guided walks, following which one attained the summits of an accompanying list of mountain tops. The guide book to the Welsh mountains had arrived; this publication formed the basis of many a young peak bagger’s first forays into the hills. After retiring from the Civil Service, E. G. Rowland returned to live at Cricieth in 1943. He was now within sight of his favourite hills where he renewed and extended his knowledge of the Welsh mountains. 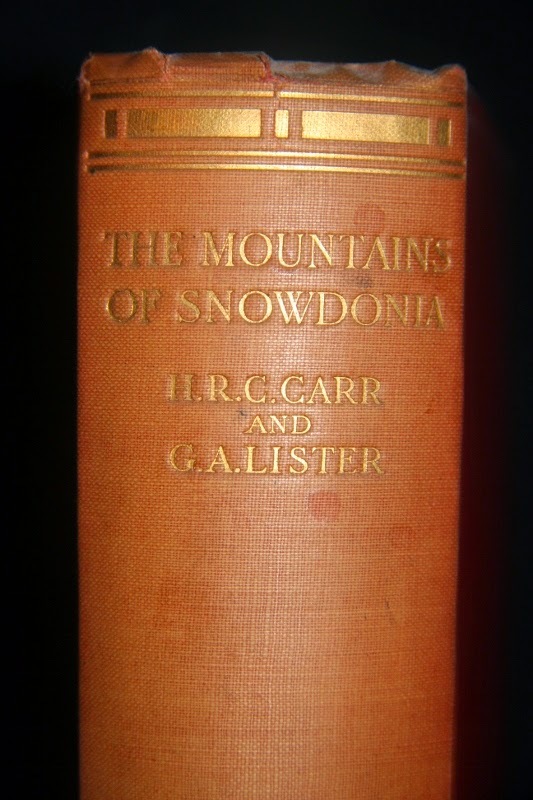 Soon he decided that although an extensive choice of literature dealing with Snowdonia existed, he felt that a gap may be filled by producing a small volume detailing an account of routes up and down all the 2,000 foot peaks in the Northern part of the Snowdonia National Park. The result was published in 1951 by the Camping & Open Air Press Ltd. ‘Hill Walking in Snowdonia’ consists of eighty three pages interspersed with black and white photographs by W. A. Poucher (who will be entering our story in subsequent years). A whole range of topics are covered including: ‘Notes on the Countryside’, ‘Welsh Words in Place Names’, ‘Countryside Societies’ and the ‘Snowdonia National Forest Park’. Chapter one is entitled ‘Introducing Snowdonia’. It is quite entertainingly informative and passes comment on a variety of subjects such as: “The native sheep that, unlike their more placid Southdown relatives, are filled with fierce Celtic blood and can negotiate anything less than a five-foot wall or a five-barred gate with the greatest of ease”, or, how to: “Prevent blisters, it is a good thing to grease your feet before putting on your socks”. A number of suggestions for proper hill walking wear follow: “The short gaiters of the Home Guard are useful. Battledress style jackets are hard to beat, while leather gloves take the chill off wet rocks. Light oilskins are as useful as anything to keep the rain out”. How times have changed. The main part of Rowland’s publication deals with his guide to the 2,000 foot mountains of Northern Snowdonia. The walks described give routes to the summits of all the listed peaks, either singly or in combination with others, with alternatives and variations incorporated. The guide to these mountains is found in chapters three, four, five and six – with detailed excursions to the Snowdon Massif and excursions from the bases of Beddgelert and Rhyd-ddu, Pen-y-Gwrhyd, Pen-y-Pass and Llanberis and, lastly, Capel Curig and Ogwen. Rowland doesn’t stop here. Within chapter seven are ‘some lower walks’ including one to the top of the excellent Moel y Gest. The inclusion of the Clynnog Hills and Yr Eifl within chapter eight’s excursions to ‘A few Outliers’ shows that although these hills are not in Rowland’s list, by mentioning them in his guide, he takes the first step in recognising the merit of hills that are lower than 2,000 feet in height. It would only be a few short years before an author listed some of these self-same hills. The list which interests us within the boundaries of this article appears on pages viii and ix and is entitled ‘Mountains in Snowdonia’. In all, fifty three mountains are listed in order of altitude with their name, height in feet, section and number of walk being detailed. The specified number given each walk can be cross referenced with each respective guided excursion whilst the specified section letter can be used in conjunction with the ‘Sketch Map of Snowdonia’, which appears on pages 42 and 43. This map is split into five sections; these are marked from A-E with each mountain’s designated number, in order of altitude being indicated on the map against its position on the ground. On page 19 of chapter two, Rowland pays tribute to the main source of his list, this is; “That excellent standard work, ‘The mountains of Snowdonia’, lists 49 peaks that top 2000 feet and of these 14 exceed 3000 feet. The list on pages viii and ix includes all of these 49 peaks, with a few additions that seemed to merit inclusion. To qualify there must be “a crest, distinct from high land leading up to some other peak”. Therefore, E. G. Rowland’s 1951 list incorporates Carr & Lister’s 1925 list with four additions. These are: Bera Mawr, Foel Gron, Gallt y Wenallt and, lastly, Gryn Wigau [sic]. Of particular note is Gurn Wigau (correct spelling) which although mentioned by Carr & Lister it did not, in their opinion, warrant a listing in their 1925 publication. Therefore, E. G. Rowland’s listing of this particular mountain is the first time it had appeared in a hill list. Also of note is the name given to the mountain at the head of the list. Up until 1951 all previous hill list compilers had used Y Wyddfa, this being the Welsh name for Wales’s highest mountain. Unfortunately, E. G. Rowland broke with this established tradition and within the context of his hill list just used the name, Snowdon. As mentioned above, Rowland’s list is very similar to Carr & Lister’s. He does employ a minimum designated height of 2,000 feet but his choice of mountains is somewhat arbitrary. Yet his publication of ‘Hill Walking in Snowdonia’ proved to be Wales’s first guide book to the mountains that also comprised a list of hills. I wonder if E. G. Rowland realised just what he had started. By this time the small disperse community of Welsh hill list compilers only numbered seven – Corbett, Carr and Lister, Parker, Moss, Walsh and, most recently, Rowland. Two of these, Walsh and Moss, were now in correspondence with one another swapping information and ideas. This, in time, had a direct result on the next instalment of our story. The year is now 1952. Ted Moss had recently become the first person to complete his and Simpson’s combined lists to the Two-thousands of England and Wales. But further studies of the maps proved that certain qualifying tops to his 1940 list had been missed. I will let the father of the 2,000 foot published hill list take up the story; “My object is to tidy up the published lists of two-thousands. In going over the whole of the ground I have found F.H.F. Simpson’s list for the Lake District to be extremely accurate and there appears to be only one omission from it. My own lists for the Rest of England and Wales are somewhat less complete and several tops, mostly small, but all conforming to the 50 foot contour ring definition have come to light”. “It can be argued that to every man there are as many Snowdons as he has made ascents, but the fastnesses of the Black Mountains or the shy secrets of Radnor Forest can give him something more that Snowdon can never give, however many ways he climbs it. It is true that the pursuit of the unknown becomes a habit and one has to beware of a tendency to reject even the finest peak with a curt ‘Not likely, I’ve done it’, or ‘Going up Cross Fell?’ – ‘No, I did it in 1933’; or ‘What about including Moel Meirch?’ – ‘No, it’s not in the list (thank God for two odd feet!)”. “It must be admitted that some two-thousands are dull. Many of the Pennine tops are likely to satisfy only those who have acquired a taste for that type of country. It is a taste worth cultivating, if only for the solitude. To some two-thousands one would not wish to return. But in this game, and it is only a game, one must take the rough with the smooth, the great with the small, and the obvious with the obscure. The Rhinogs nowhere reach 2,500 feet but they provide the roughest and toughest walking in Wales, and the rarely visited tops round the Hirnant Valley near Bala are a close second. The two thousands are of that middle height from which the distant views look their best”. Walsh had instigated the correspondence between himself and Moss of which Ted Moss states: “I am indebted to A. St. G. Walsh for drawing my attention to two of the additional tops in Wales. He is a mine of information on two-thousands and has recently published an account of his researches”. After this public thank you, Moss comments on Walsh’s article : “Unfortunately Walsh gives only a specimen list and does not indicate to what extent he depends on objective measurement or on subjective judgement in deciding whether the drop is more or less than 50 ft”. This is the first of only two published comments made between the only people to have compiled a comprehensive list to the Welsh 2,000 ft mountains. The update to Moss’s list appears on the last page of his article. Nine new two-thousands are listed, two being in England with the remaining seven being in Wales. The combined total of English and Welsh two-thousands now stood at 621, with Wales’s total being 244. None of the seven new Welsh two-thousands had appeared in a hill list before. Moss was correct when he described them as “mostly small”, as none are significant. Simpson’s and my own lists are all based on the 50 ft contour ring definition, which is admittedly arbitrary; but they include also a number of tops without a contour ring, tops which were included originally for sentimental, local or other reasons. The collector who wishes to be arbitrary in a consistent manner will exclude these tops and reduce the number to 216 for the Lakes, 150 for the Rest of England, and 243 for Wales. On the other hand there are a number of worthy tops over 2,000 ft with very distinct rises all round which nevertheless do not figure in the lists because their rises occur between adjacent 50 ft map contours. Examples are Tewit How, Crag Hill, and Craig Ysgafn (all contours are missing on the map hereabouts). The identification of all the ringless tops in and out of the lists is left to the initiative of the collector”. 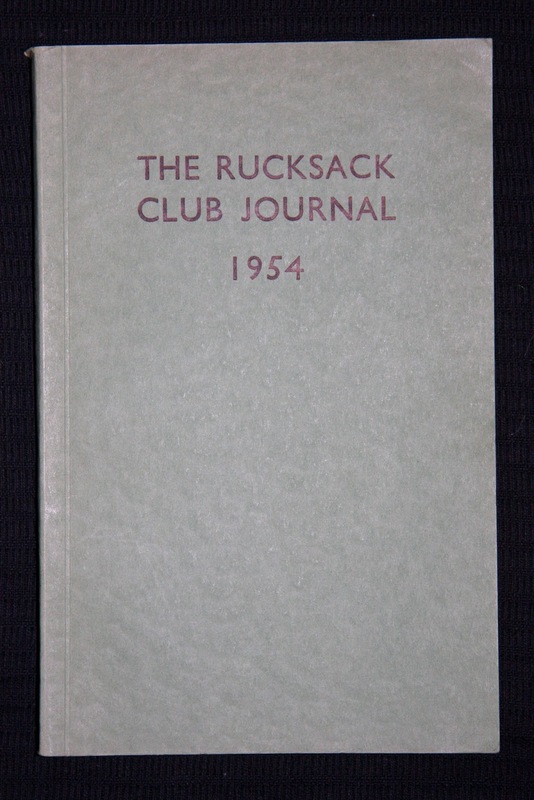 Only two years later and Ted Moss updated his list again and so in 1954 the Rucksack Club Journal published a one page article entitled “More Welsh Two-thousands”. The latest update was initiated by the publishing of the new Seventh Series Edition of the Ordnance Survey One-Inch map. All the contours on the new map had been re-drawn. This resulted in many changes. Eight new Welsh Two-Thousands were added to the list. Two of these are of particular note – Pumlumon Fach, which Moss called Pumlumon Fach, N.W. Top and Allt Lwyd in the Brecon Beacons – both receiving their first ever listing. 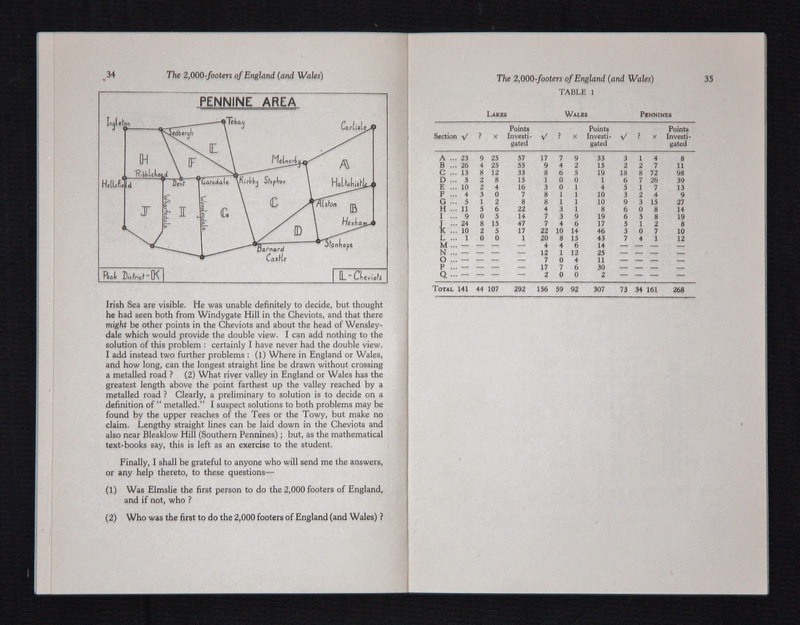 Moss passes comment on the anomalies between the old Popular Edition One-Inch map and the new Seventh Series Edition; “The new map is no more consistent than the old one, for several prominent peaks have no contour rings on it. Pen Helig, for instance, unmistakably a peak on the ground and with two contour rings on the old map, has none on the new,” and “Allt Lwyd had no contour ring on the popular edition but has two rings on the new map”. Study of the new maps showed that seventeen tops had lost their contour rings. Moss decided not to list these and ends his article emphasizing that; “It is of course, convenient to use the map as a standard but the claims of many tops can really only be decided on the spot”. “To those who prefer the dull routine of well-remembered and too-often accomplished ascents, the peak-bagger is one who dashes soullessly from top to top and whose memory of the day can be summed-up in a tick on a list. But to me collecting tops in a list provides a framework for widening experience in the fascination of fresh country, unknown hills, and other natural beauties. The pursuit of two-thousands has taken me to many places I should otherwise never have visited; it has, in fact, taken me into some of the most God-forsaken spots in this country as well as to some of the most delectable”. 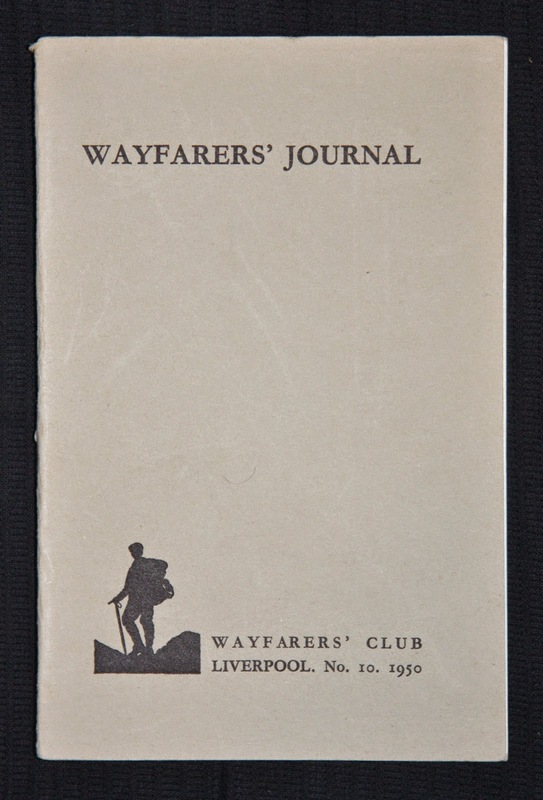 In 1956 a half page article, which was, in fact, a letter to the Editor of the Wayfarers’ Journal, appeared in that publication. It was entitled ‘The 2000 Footers of England (and Wales)’. The sender of the letter was Arthur St. George Walsh. The revised totals for Wales now stood at 155 definites, an increase of one over his 1950 total. The doubtfuls had increased from 59, in 1950, to 62, whilst the 92 definitely nots in 1950 had increased to 97. The overall number of points investigated in Wales was now 314. When combined with Dartmoor and his Lakes and Pennines areas the revised totals amounted to 373 definites, 139 doubtfuls and 366 definitely nots. This meant a staggering 878 points had been investigated. In his 1950 Wayfarers’ Journal article Walsh posed a number of questions, two of which were, “Finally, I shall be grateful to anyone who will send me the answers, or any help thereto, to these questions –”. At the end of Walsh’s 1956 update he states : “Since my appeal for information as to the first persons to complete these exercises remains unanswered, may I help future researchers by recording that the late W.T. Elmslie finished his (somewhat different) list of 348 for England on 25/11/44”. Ever the one for detail, Walsh thankfully lets us know that W.T. Elmslie was the first person to complete a list of the English 2,000 footers. Elmslie, who was a Methodist Minister and a good hill walking friend and colleague of Walsh’s was killed in his London Church by a V2 rocket during the Blitz. The half page article ends with Walsh telling us about his own completion: “My 512 finished with Snaefell on 31/12/53”. With this all too brief an update, Arthur St. George Walsh’s participation in published articles concerning his hill list is at an end. He will be mentioned, along with his hill list, in detail, but this will have to wait another seventeen years. 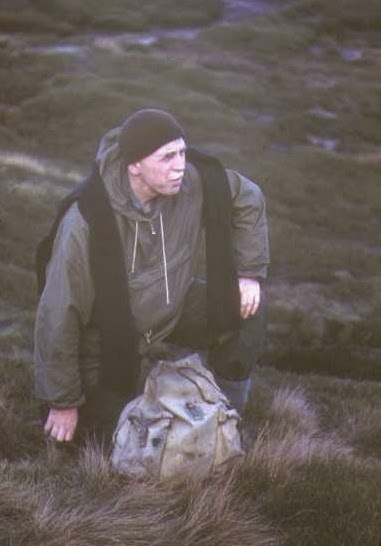 He, along with Ted Moss, led the way for all Welsh 2,000 foot hill lists that followed. What is so remarkable about Arthur St. George Walsh is that his meticulous hill list compilation efforts are almost unrecognized. With his ascent of Snaefell he became only the third person to complete a list to the combined 2,000 foot mountains of England and Wales. Even this is now under debate, as there is evidence to suggest that Walsh had, in fact, completed the English and Welsh part of his definites sometime in the 1930’s. If this is true, it would place Arthur St. George Walsh at the head of the list for the first full completion of the combined English and Welsh 2,000 foot mountains, this being based on a methodical and carefully checked list of tops with 50 feet of re-ascent on all sides. Walsh has been described as a “Kind and cultured gentleman with an extensive knowledge of the hills”. I also suspect he was rather humble. But perhaps, and hopefully, Arthur St. George Walsh should, and will, take his rightfully earned place where he deserves to be, and that is at the head of a list. This is the last instalment of The History of Welsh Hill Lists that I have written. If any future instalment appears notification will be given on the Mapping Mountains site.